Datemaki (伊達 巻?) Is Japanese food made from eggs, similar to atsuyaki tamago but with a mixture of fish and shrimp are crushed and given mirin and sugar in large quantities so it feels sweet. All the ingredients are roasted using a rectangular skillet until they are hardened and have a texture like a cake that after being cooked is rolled up similar to a sponge roll. 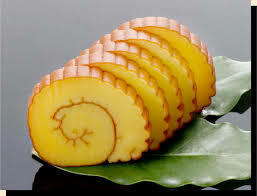 In the famous Nagasaki area with castella cake (kasutera), datemaki is also known as kasutera kamaboko.